A month in the biblical calendar is measured by the cycles of the earth’s moon. A month is the period of time between one new moon and the next. Since the moon orbits the earth in about 29.5 days, biblical months are either 29 or 30 days in length: they cannot be 28 or 31 days in length. Since the Bible record is not explicit about the process of determining the timing of the actual new moon, the method historically practiced by Israel (and still practiced by Karaite Jews today) is to declare Rosh Chodesh (the new moon) when the crescent-sliver of the new moon is first sighted with the naked eye from Jerusalem by two credible witnesses. 1 Sam. 20:5 And David said unto Jonathan, Behold, tomorrow is the new moon [i.e., when it was expected], and I should not fail to sit with the king at meat [the Rosh Chodesh celebration]: but let me go, that I may hide myself in the field unto the third day at even. 20:24 So David hid himself in the field: and when the new moon was come [i.e., the first day of the month], the king sat him down to eat meat [the first day’s Rosh Chodesh celebration]. 20:27 And it came to pass on the morrow, which was the second day of the month, that David’s place was empty: and Saul said unto Jonathan his son, Wherefore cometh not the son of Jesse to meat, neither yesterday, nor today [to the second day’s celebration]? David said he would hide himself until the third day (after 48 hours had elapsed), and Saul had been waiting for him to show up to the Rosh Chodesh feast “yesterday” and “today” (for 48 hours). Even some contemporary Jewish traditions speak of two day celebrations during the new moon appearance. As discussed above, once the new moon has been duly verified, the month begins. However, if weather obscures the possible sighting of the new moon on the 29th day of any month, that month then defaults to a 30-day month, and regardless of the weather, Rosh Chodesh is observed the evening of the 30th day (remember, the biblical day starts at sunset). Therefore, if the weather is clear and the sliver of the moon is seen around sunset on the 29th, then the new month begins. If it cannot be seen due to weather or it is yet too dim to be detected with the naked eye, then the month defaults to 30 days. As you can see, using this visible sighting method demonstrates that the months of the biblical calendar are not always able to be forecasted with precise accuracy, as local weather and atmospheric conditions could also play a part in determining the actual start of each new month. Additionally, even if the entire earth were clear of clouds, the new moon crescent is still seen at different times in different locations around the globe. Complications in sighting the crescent moon and technical aspects of astronomical cycles have left questions about other methods that may have been in use. One thing that does not change is the astronomical new moon (conjunction). While it is technically invisible, it is reliable, consistent, and verifiable through calculation. To me, this kind of historical evidence suggests that, while the ancient Israelites may have formally adopted the visible crescent method, it does not rule out the possibility that they also had the ability to calculate the astronomical conjunction to verify when the new month was about to begin. Another benefit of the lunar month is derived from the phases of the moon itself. If each month starts with the new moon, then a simple glance at the current phase of the moon throughout the month will always give an indication to any observer how far along the month has progressed. 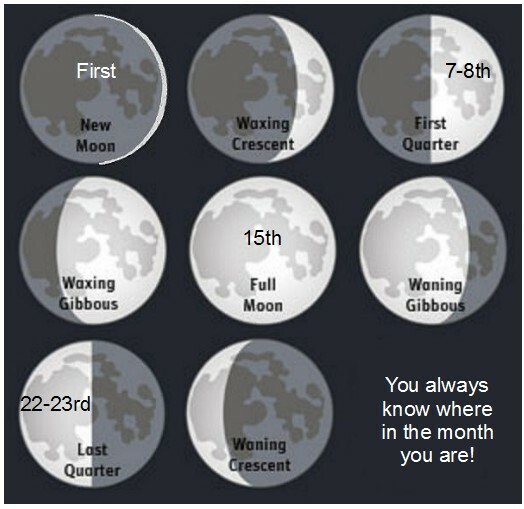 A first-quarter moon always will always be on the 7th-8th of the month; a full moon is always on the 15th; a third-quarter moon will be on the 22-23rd; the final phases indicate the next Rosh Chodesh is quickly approaching. It is a simple, practical, and reliable way to estimate the progression of the month in ages previous to wall calendars and timepieces. While there are many traditions that have come into being around the monthly calendar, the fact remains the simplicity of the lunar cycle and its phases is an elegant way for our Creator to remind us where we are within the flow of the days and weeks as they go by.